Massive Aztec Epidemic May Hinge On Salmonella : The Two-Way The 16th century epidemic, likely set off or exacerbated by European invaders, was one of the most deadly in human history. New evidence traces it to a type of salmonella that causes a deadly fever. 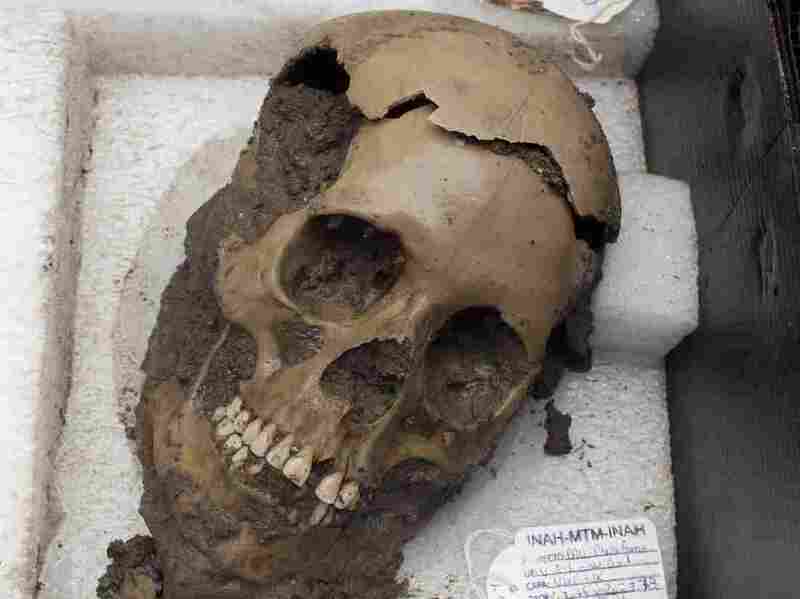 A skull discovered at a sacred Aztec temple. A new study analyzed DNA extracted from the teeth of people who died in a 16th century epidemic that destroyed the Aztec empire, and found a type of salmonella may have caused the epidemic. In 1545, people in the Mexican highlands starting dying in enormous numbers. People infected with the disease bled and vomited before they died. Many had red spots on their skin. It was one of the most devastating epidemics in human history. The 1545 outbreak, and a second wave in 1576, killed an estimated 7 million to 17 million people and contributed to the destruction of the Aztec Empire. But identifying the pathogen responsible for the carnage has been difficult for scientists because infectious diseases leave behind very little archaeological evidence. "There have been different schools of thought on what this disease was. Could it have been plague? Could it have been typhoid fever? Could it have been a litany of other diseases?" says Kirsten Bos, a molecular paleopathologist at the Max Planck Institute in Germany, and an author of a new study published Monday in Nature Ecology and Evolution. The study analyzes DNA from the teeth of 10 people who died during the epidemic and pinpoints a possible culprit: a type of salmonella that causes a deadly fever. A new algorithm allowed Bos and her team to identify fragments of ancient salmonella DNA with extreme specificity. "It was an analytical technique that was really the game-changer for us," Bos explains. While scientists have been able to extract ancient DNA from bones and other tissue, until recently it was impossible to compare that extracted DNA to a wide variety of potential matches. But a new computer program called MALT allowed them to do just that. "The major advancement was this algorithm," Bos says. "It offers a method of analyzing many, many, many small DNA fragments that we get, and actually identifying, by species name, the bacteria that are represented." Bos and her team used MALT to match up the DNA fragments extracted from teeth of epidemic victims with a database of known pathogens. The program didn't entire save them from mind-numbing work — at one point PhD student and study author Ashild Vagene had to go through the results of the program by hand. In the end, they found evidence of the deadly Salmonella enterica Paratyphi C bacteria. The study does not pinpoint the source of the bacteria, which is an area of great interest for biologists and archaeologists alike. The authors note that many epidemics of the period are believed to originate with European invaders who arrived in the region in the early part of the 16th century, but the new research doesn't present biological evidence for or against that. A previous study suggested the pathogen responsible for the epidemic originated in Mexico, and that the epidemic was exacerbated by drought. And, Bos notes, "the Europeans who were observing the symptoms didn't know what it was, and Europeans got it as well," which suggests it wasn't a disease endemic to Europe. But even if Europeans did not introduce the pathogen, they may still be responsible for its profound deadliness among indigenous people. "We know that Europeans very much changed the landscape once they entered the new world," Bos says. "They introduced new livestock, [and] there was lots of social disruption among the indigenous population which would have increased their susceptibility to infectious disease."